My favorite weekend of the year has arrived. Memorial day to be has always been the quintessential kick-off to 'It's Summer'!!! The time is here, and I'm soooo ready to be kicking off my most favorite season! Time to grab your favorite summer essentials and hit the outdoors! Pool, beach, park you name - it's the season where the outdoors reigns king! 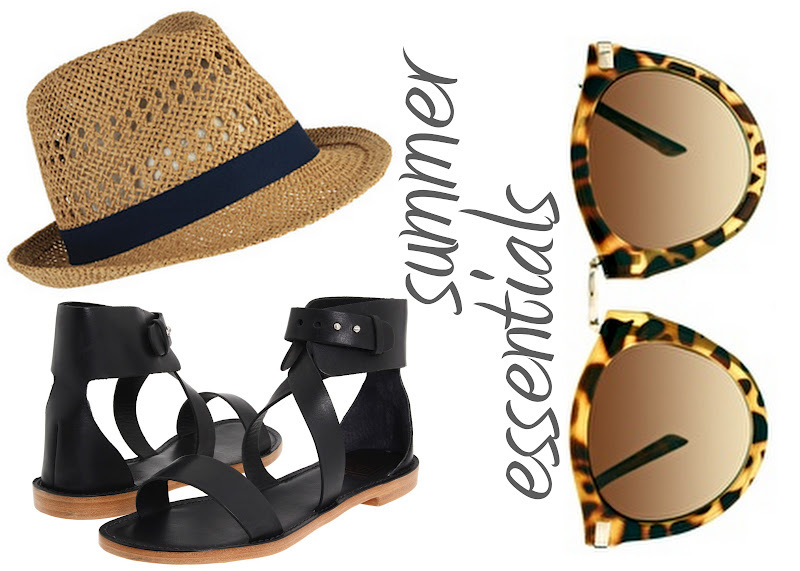 My summer essentials are a fab pair of sunglasses, a shade providing hat and a great pair of flat sandals. Preferably many combinations of them, too! :) Cuz a girl needs options, duh!!!! And of course sunscreen (we have to take care of our skin) & a cute new bikini! I really love all the above....That hat would go great with my new white jeans & a tank....Those glasses with my black maxi dress and a crazy bun.... Those sandals with, well anything, I love how simple they are! are you stocked up and ready for summer??? I still need to get some Rx Sunglasses - I swear my eyes are getting worse, been wearing my glasses daily. But I have pairs on standby, and a new bikini ready for the pool this weekend!!! That cute hat makes me so happy! i need new sandals and i love these. all of mine are legit falling apart. its 100% no bueno. Those sunglasses belong in my wardrobe. period. It's all so summer-fab. I love the hat! Lovelovelove those glasses! Adorable! New follower for sure. What a cute blog!